The card helps reimburse the expenses of search and rescue missions, by funding the Colorado Search and Rescue Reimbursement Fund. Twenty-five cents of each Colorado hunting and fishing license, and boat, snowmobile and off-highway vehicle registration also goes into the fund. When you purchase a CORSAR Card, $2 of the $3 price for a one year card and $9 of the $12 price for a five year card goes into the fund. These funds are then used to reimburse county sheriffs and search and rescue teams for actual expenses they may have during a mission. The fund also helps to pay for equipment and training for Colorado’s search and rescue teams. Where do I purchase one? Why should anyone buy one? Buying a COSAR Card helps ensure that a county sheriff and the SAR team are able to respond to your emergency: it helps financially maintain their readiness to respond when your emergency call comes in. What happens if I don’t have a COSAR card? 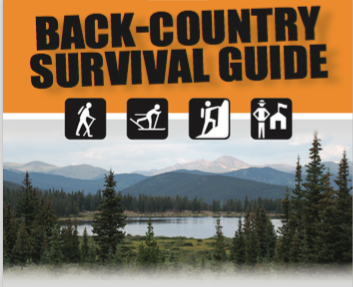 If someone does not have a Colorado Outdoor Recreation Search and Rescue Card (or one of the licenses or registrations) the county or its search and rescue team bears the expenses that might be incurred in a search or rescue. If a financially-strapped county or SAR team accrues previous un-reimbursed extraordinary costs, it may be difficult for them to properly respond to your emergency. How does the COSAR card assist SAR teams? Through SAR Fund grants, SAR teams receive equipment, such as radios or ropes, and send team members to special SAR training courses. The fund will also pay for team or volunteers’ equipment that is damaged during SAR missions. NO. The COSAR Card is not “insurance” nor is “insurance” needed. Sheriffs and SAR teams do not charge for SAR in Colorado, so never hesitate to call for help. Delaying a call for a SAR team can cause needless danger in a rescue, or unnecessarily complicate a search for a missing party. Always err on the side of caution and call 911 as soon as possible. County sheriffs and their search and rescue teams will respond to your emergency whether or not you have a COSAR Card. Where does the money for a rescue come from? What does a search and rescue mission cost? There usually is not a great cost of an individual search or rescue mission. The cost is not to respond and carry out the mission — it is in preparing for one and standing by: training, equipment, insurance, vehicles, maintenance, fuel, supplies, etc. How does this fund work? The Colorado SAR Fund is a state-administered reserve pool of money that can reimburse a county sheriff or a search and rescue agency for expenses **they** might incur in search and rescue missions: damaged or destroyed SAR team and personal equipment, helicopter time, food for searchers, fuel and the like. Search and rescue teams are the usual recipients of SAR Fund money. Just as importantly, it provides tens of thousands of dollars in grants for training and equipment to Colorado’s search and rescue teams. What good is a CORSAR Card, a sportsmen’s license or vehicle registration? They protect your safety by ensuring, through grants, that a trained and equipped search and rescue team exists and is standing by, should you ever need it. And it gives each county sheriff a pool of reimbursement money if an and infrequent large, long or expensive mission occurs. It does not “insure” you against a bill for a helicopter (you should expect a bill for a medical helicopter, just as an ambulance), or for rescue operations, or for a multiple day search: there is no bill for search and rescue team’s services in Colorado. It is Colorado’s financial safety net that protects rescuers and sheriffs, by ensuring a sheriff’s department can afford occasional expensive mission costs; and by equipping and training Colorado’s SAR volunteers.